so here i am. baby girl is getting bigger, and thus so am i. i was still working out 3 days a week at this point in my pregnancy with foster. it's safe to say i am not doing that this time around. reaaaalllly safe to say. i am, however, eating chocolate chip banana bread by the loaf. this is my attempt at photographing myself before church… which, by the way, is the only day of the week that i get dressed. hence why i only have one outfit on any what i wore post. every other day of the week i am wearing my maternity H&M leggings which are heavenly, i tell you, heavenly. oh wait.. i am wearing them here too. when my self timer photography attempts fail, i have to force my sweet husband out to take some pictures of me. meanwhile i make some really great faces and get blown away by the wind. sigh. tis the life of a fashion blogger. thankfully for me, when my baby bump is taking over everyone's life, i have a cute accessory that distracts them. like that clutch right thur. chevron? yes, puhlease. black and white? mmhmm. kate, from sew kate sew sent this pretty baby my way and i am loving her for it. this darling thing is perfect for date night. toss in my keys, cell phone, lip stick, and wallet, and i am out the door. and the other great thing? 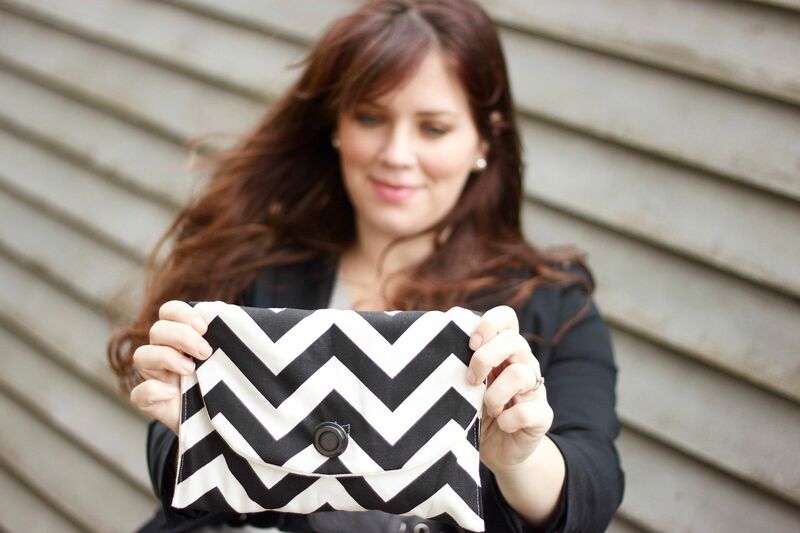 she had the mama's in mind when she created this clutch. it's the perfect size for a couple diapers and a travel pack of wipes. 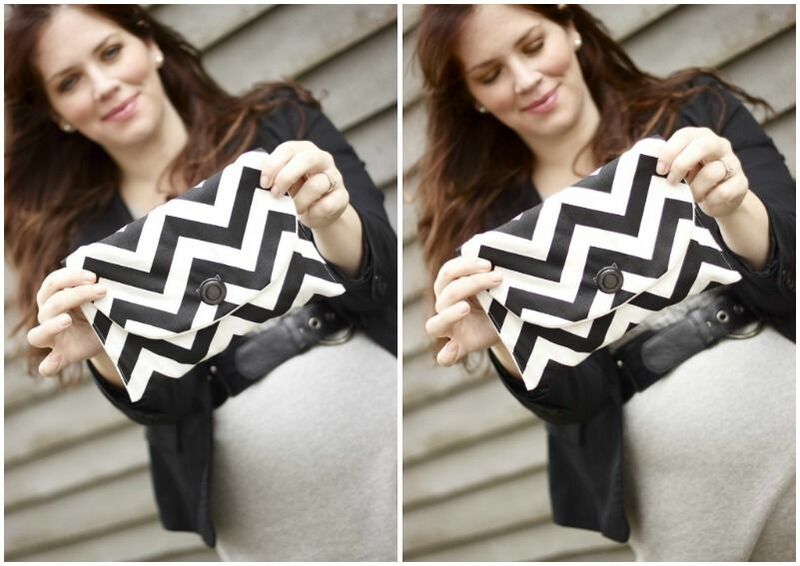 you should probably include this clutch with every pack of diapers you buy for a pregnant mama. again, please enjoy my faces due to wind gusts. i am rockin', and i use the term rockin' very loosely, H&M leggings (duh), maternity sweater dress from express… this was passed down from a friend, i only shop target clearance and salvation army... obvi. the black jacket is from target in like the year 2000. seriously. and my pretty see kate sew clutch to tie this little ensemble all together. go get yourself a clutch, i'm gonna go romp around in my leggings and a t-shirt, and scare people. where is my banana bread? And PS hanging out in leggings and a t-shirt is the absolute BEST! You are so beautiful, that baby girl is going to take after some good moma genes! you're cute as a button! You couldnt look cuter sweetie! And speaking of all things delicious....'cause you were right?...did you know that Haagen Dazs makes Sweet Chai Latte Ice cream? Uh ...yes please. One for you and one for me? have fun scaring people. HA. Darling! You're hilarious! 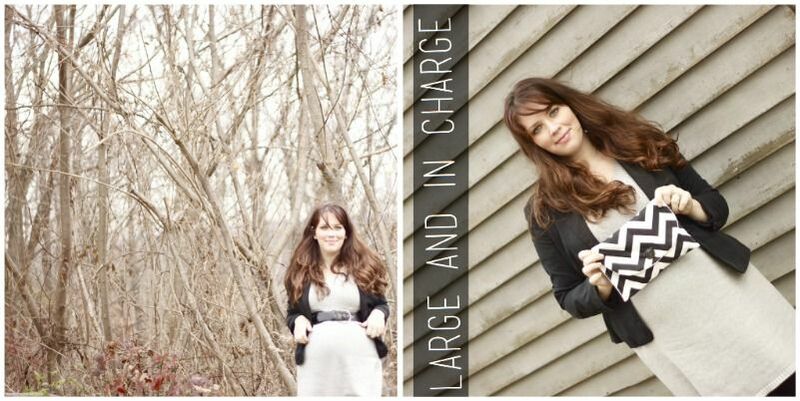 I totally was a thrifter for maternity clothes. Too darn expensive to buy new! you are adorable girl! I'm lovin' me some maternity leggings at the moment as well. They are THE most comfortable thing to wear! YOU ARE THE FUNNIEST IN THE WORLD. I want to fly to you and rub yo belly. you look adorable...which is hard to do when pregnant. i <3 maternity leggings and will likely never wear regular ones again. You make me smile. I'm also just finding out that H&M makes maternity clothes. What the what?!? And I loved that entire H&M mama line ~ I swear I'm still wearing those tanks. I love that clutch and you are so cute!! I am in LOVE with your hair!!!! SOOOOO pretty!!! You have to be one of he funniest people ever! Have to be. Love your outfits, but more so, love your sense of humor! you are gorgeous. you and that big beautiful bump. YOU CRACK ME UP about your banana bread and leggings! Thanks for always brightening my day. ahhhh i miss being pregnant and being able to down loafs of bread and bags of nestle chocolate chips. YOU however look amazing. and that clutch, crazy hot. Chocochip banana bread? Oh man. I want some now and I have neither chocolate, nor banana, nor bread. My evening is ruined. Wait, I found bread. It isn't totally ruined. Also, you make a gorgeous prego mama, you have great hair, and that last sentence made me laugh, out, loud. obvi. that was great. you are cute. and your babers will be too. what i cute baby bump, I love the dress and leggings look it look cute on you and you don't need to distract fro it with the gorgeous clutch. Baby bumps are the one time you can proudly display you belly. you are so funny! as if you don't know that you look so adorable & well put-together! and, if you didn't know--you do! keep rockin those leggings...H&M clothes are the best!